The LG Xenon is a smart phone and combines a touch screen with a awesome sliding QWERTY keyboard into a slim fairytale package. It has HSDPA, stereo Bluetooth, GPS, music and video playback and yet is budget priced. The Xenon has a customizable home screen with widgets, with pages dedicated to favorite contacts and applications. There is also something called the “Annunciator”, which is nothing but a drop down menu of a few short cuts. 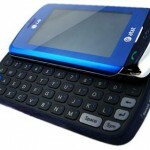 It has Bluetooth, a 2 mega pixel camera, a music player, a full HTML browser and much more.. 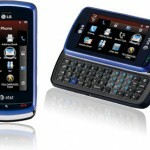 The LG Xenon is priced at $99.99 with a two-year service agreement. 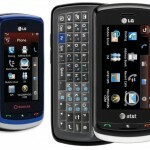 It is targeted for those who want a QWERTY and like the ease of navigating via touch screen. Infact The new LG Xenon is innovation at its best. It has a Touch Keypad with Vibration Feedback, microSD TM Memory Port, is Bluetooth ® Capable, has a 2.0 Megapixel Camera & Camcorder with Flash and a QWERTY Keyboard The Technology: is GSM. The Xenon is a solid phone, good looking though not chic and is affordable. The keys are easy to see in the dark because they are backlit white .The display brightness too can be controlled. The Xenon has smooth, sleek lines all around it , with a touch of chrome around the border. In comparison to the Samsung Impression, released at the same time the Xenon has a less fancy, display and a lower resolution camera. It is in fact one of the most poketable phones in the market. LG has made this phone easy to use and made it more fun to use as well with the home screen. With a resolution of 240×400 pixels and 262k colors the LG Xenon has a 2.8 inch resistive touch screen that is quite responsive . Colors are pretty well differentiated, although black levels are not too good. Even when the brightness is placed to the highest setting even in direct sunlight you can see whatever is on screen pretty clearly. The QWERTY keyboard is a bit cramped with no space in between the keys and the navigation keys cannot be used to guide through the menu except to move the cursor when typing. Some buttons are found on the QWERTY to quickly launch certain applications such as , IM client , mobile e-mail, the phonebook, and web browser. As usual, the web browser is nothing great from LG but the Xenon makes for excellent messaging. However I feel that the touch screen response is not too great and the user interface is inconsistent but the LG Xenonis over all a good phone. This phone is crap. I went through three and at&t is giving me a different phone under warranty. It is not made for heavy use, it breaks VERY easily. Like Jess said, this phone is the king of crap. At first I thought it was nice when I first got it but the screen actually pops out on the phone and can actually come all the way off. It’s only connected by a friggin wire! Learn from my mistake and never, ever buy this phone! I don’t know what phone the other two had, but my Xenon is great. I’ve had it for two years and it’s never ever broken. I’ve probably dropped it 30 times and it’s always been fine, save a few scratches. It’s a great messaging phone and you can even read the screen in the brightest sunlight. The only problem I have is with the Internet. When I go to a webpage I have a hard time clicking on a link. But that may only be me. Now there are a lot better smart phones, which I would recommend over mine, but when I got the phone, it was top of the line. I’ve never regretted buying it.